Shear Madness was a 56-foot Oyster sailboat owned by Bradley Rosenberg and Kathy Clark. 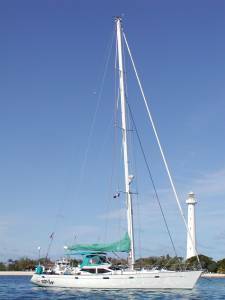 From 2000-2007 we enjoyed many great sailing adventures in and around Australia and New Zealand. We sold Shear Madness in late 2007 and returned to work for a couple of years. In 2010 we purchased the new Shear Madness, a 72-foot Nordhavn trawler. We have now retired again and are planning to resume the cruising lifestyle aboard the new Shear Madness. Follow the links below to see our original adventures or click here to go to our new website. Follow the links below for current book reviews and updates on our recent activities. Or click any of the links below for more information. To email us, click here.